Originally propsed by William S. England. 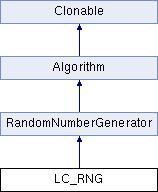 LC_RNG is suitable for simulations, where uniformaly distrubuted numbers are required quickly. It should not be used for cryptographic purposes. Definition at line 22 of file rng.h. Definition at line 27 of file rng.h. Definition at line 39 of file rng.cpp.